“Dogs are not our whole life, but they make our lives whole. If there are no dogs in Heaven, then when I die I want to go where they went” said Roger Caras, writer and photographer. A dog can be one of the greatest sources of joy for owners of any age, including the oldest among us. Seniors should adopt an adult dog with a history of good health and good temperament. Keep in mind that mixed breeds often have fewer health problems than purebreds. The following are six of the top dog breeds recommended for seniors according to DogTime. 1 – Pembroke Welsh Corgi. Corgi’s are known for being happy, loving, and intelligent, but with a stubborn streak at times. They are easy to train and motivated to learn new things when a treat is presented. They also make great watchdogs and alert the owner of a stranger’s presence. 2 -Yorkshire Terrier (Yorkie). Smart and self-assured, the Yorkie is a combination of endearingly small size and adventurous terrier spirit. The breed displays a range of personalities. Some are cuddly and perky, wanting nothing more than to follow in their owner's footsteps throughout the day. Others are mischievous, outgoing, and into everything. Set limits, and your Yorkie will be a wonderful companion; but if you spoil them, watch out! 3 - Pug. Pugs are adorable, energetic, and humorous at every age. These low-maintenance little canines easily adapt to any lifestyle. Whether you are laid back or like to take long brisk walks every day, your pug will be perfectly content being right there with you. 4 - Shih Tzu. If you would like an adorable small dog that doesn’t tend to be a yapper, a Shih-Tzu may be the perfect companion for you. The breed requires daily brushing and regular grooming, but sheds very little. These are smart little dogs that do well with low to moderate exercise. Note that Shih-Tzus are typically quiet dogs, but do bark when a stranger is present. 5 – Pomeranian. The foxy-faced dog, nicknamed “the little dog who thinks he can,” is compact, active, and capable of competing in agility and obedience or simply being a family friend. The Pomeranian is smart and vivacious. They love meeting new people and get along well with other animals, although they sometimes think they’re a lot bigger than they really are. Alert and inquisitive, Pomeranians also make excellent watchdogs and will bark at anything out of the ordinary. 6 – Boston Terrier. For a friendly and happy-go-lucky dog that is attentive to your needs, compact, requires minimal grooming, and is an all-around excellent companion, you can’t go wrong adopting a Boston Terrier. There are three weight categories, ranging from under 15 pounds up to about 25 pounds. Regular exercise is important because this is an energetic breed. These are just six of many community friendly dog breeds that are recommended for seniors. 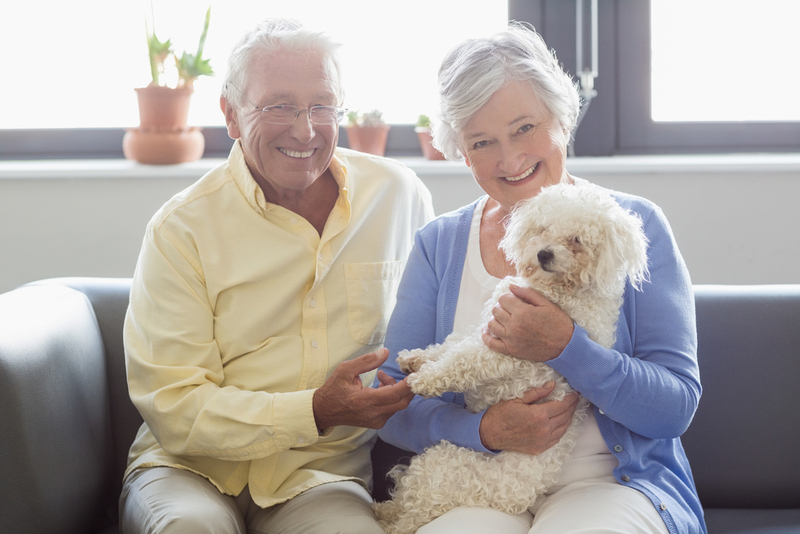 American Humorist Josh Billings said, “A dog is the only thing on earth that loves you more than he loves himself.” Here at Discovery Village Senior Living, we encourage residents to have pets as companions. Before making the big jump into having a pet, make sure the pet fits your family’s personality and lifestyle.